Enhance your style in tailored bold blue. 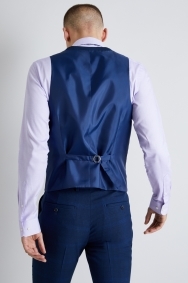 This waistcoat from Moss London is your chance to show off effortless style with bold character. With a rich, peacock-blue backdrop and lighter blue check, it’s sure to turn heads at any smart event. The slim cut means it’ll sit close to your body and define your frame, and the adjustable strap at the back will allow you to wear it comfortably and with confidence. Team with matching trousers and suit jacket to complete the ensemble. 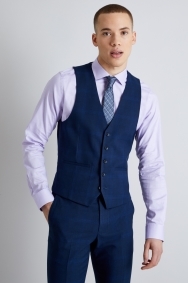 A lighter-coloured shirt and mid-tone tie in similar blue hues will create the ideal balance.